The New Inn was first mentioned as licensed premises in 1883, with the innkeeper listed as John James. At the time there was a cider press in the garden – it’s still there to this day, although not in use. In the adjacent suite lived John Probert who eventually became innkeeper in April 1840. Around 1885 the landlord was Thomas Davies. 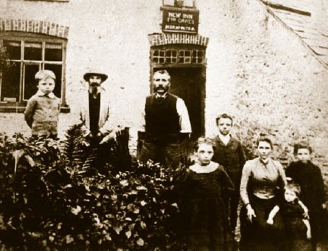 He lived at the inn with his wife Matilda and their five children Thomas, Rhoda, Ernest, Matilda, and Lilley (pictured left). They appear to have lived here for the next fifteen years or so, although in the census of 1901 the innkeeper was James Ross. The New Inn remained as licensed premises until 1949 when the last innkeeper did a ‘moonlight flit’ and disappeared, leaving many debts. An amusing anecdote concerns a neighbouring farmer from Little Merthyr who used to frequent the New Inn. He was leaving one night, somewhat inebriated, when he encountered the vicar coming down the hill. The vicar greeted him the “Drunk again?” to which he replied, “So be I” and went merrily on his way.
. Small Breeds Farm Park & Owl Centre"It has taken 21 years to gather together one of the finest collections of Owls in Europe." Today in Hay you will find the eccentricity goes beyond book shops, antiques, collectables, Becky’s vintage clothes shop like no other, together with Toms, real interesting collectables of a good eye, Bain & Murrin’s World Famous Emporium, 4 Hightown, Hay-On-Wye. From Hay you can drive up the black mountains, to the Bluff where you can venture on paths for spectacular walks, on clear days a 360 view of the over the hills and surrounding valleys. There are churches and chapels dotted around the black mountains. One such is Cwmyoy Church, described as Britain's most crooked church. It is located seven miles north of Abergavenny and four miles south of Llanthony in the Vale of Ewyas. Centuries of subsidence caused the tower and chancel to move in opposite directions, twisting the entire structure. Some claim that the church tower leans more than the Leaning Tower of Pisa. The Boat Inn - Pub https://whatpub.com/pubs/HFD/2589/boat-whitney-on-wye A mile down in Whitney on Wye, not a very pleasant walk unfortunately on a busy road. His Holiness The 14th Dalai Lama of Tibet "Never give up... no matter what goes around you .. never give up..."
"Don't learn from Buddhism to be a Buddhist, learn to be a better whatever you already are"
Bokar Ngedon Chokhor Ling (Bokar Monastery)"with the power of teaching subtly, as stroking with a feather"
Spending a weekend out camping resets the clock inside our bodies that influences sleeping habits, scientists at a US university have discovered. The team argue that time in the great outdoors could help those struggling to get up in the morning and boost health. The researchers said swapping bricks and mortar for canvas was not a long-term solution. But exposing ourselves to more bright light in the day (and less at night) could help. Our body has a daily "circadian" rhythm that anticipates day and night to co-ordinate how our body works. It alters alertness, mood, physical strength, when we need to sleep and even the risk of a heart attack as part of a 24-hour cycle. Body Clock: What is happening in your body right now? Light helps the clock keep time, but modern life with artificial light, alarm clocks and smartphones has altered our sleeping habits. The report is published in Current Biology and Dr Kenneth Wright, from the University of Colorado Boulder, told the BBC: "We're waking up at a time when our circadian clock says we should still be asleep." He says this is damaging to health with studies suggesting links with mood disorders, type 2 diabetes and obesity. And it also simply makes us really groggy and sleepy when we try to get up in the morning. So Dr Wright organised a series of camping expeditions for a small group of volunteers. They had to wear special watches that recorded light levels and had blood tests to analyse the sleep hormone melatonin. And the only artificial light they were allowed was the glow of a campfire, even a torch was banned. The first thing they learned on a week-long camping trip in winter was people were exposed to 13 times more light than at home, even though it was the darkest part of the year. Their melatonin levels also started to rise two-and-a-half hours earlier than before the expedition and they went to bed earlier too. The campers were now sleeping and waking in tune with their body clocks.Another camping trip showed most of that benefit could be gained by just going away for a weekend. I fell in love with this place, it inspired me to dream and create many diverse, cosy living spaces, whilst I carried on developing my spiritual side. It is a reflection of the gipsy, nomad, traveller, earthy nature loving peasant and nest making sides of myself and discovering the infinity of our potential. The Elements, Earth Fire Water Air and Space in harmony…. We are the elements, we need to connect to nature, at least every now and then so to be reminded who we are.. So what do we need to be well? the elements that nature offers us, with a bit of comfort, a log fire, good food, hot showers and a hot tub!, a good friend, peaceful surrounding, may be the sunshine, maybe the wind, maybe rain or snow, with the gratitude to experience to witness this temporary fleeting manifestation. Well if all this makes sense to you then you will find here what you are looking for…..
And important for me, I want to say, after having lived in many different countries in different places, for the first time in my life I feel at home here, this is my home, and only if you think you will be happy here I really want to share it with you ….